: Yes. I confirmed Machineland's explosion, as well. : What movements did the Irregulars show after that? : They are currently headed for Gallia. : ...So they intend to come here. : Intercept them, of course. Have the Earth Cradle surface, and let Sanger dispose of them. : After that... Disseminate our Machine Cells, and wipe out the entire human race. : Then, let's hear your report. : Yes, sir. We looked into three people that participated in the DC's Project Ark and were involved with the construction of the Earth Cradle. : Lady Ryune, you're familiar with Dr. Nate? : Indeed, you are correct, sir. She was a highly talented scientist with the former DC... And she performed studies concerning autonomous self-repairing metal cells. : It has similar properties, but it is different. These likely became the basis for their Machine Cells. : I would guess that those autonomous self-repairing metal cells... Were something developed based upon the study of the Zehirut Crystals that the Aerogators possessed. : Then the Ancestors have some connection to the Aerogators...? : Given the fact that they've used no Aerogator machines, I would highly doubt that. : Then why, exactly, did they make those things to start with...? : I think it probably would have been to ensure the Earth Cradle remained structurally sound. : So they've been continually repairing themselves over thousands of years? : One could continue living over a long time, as we did with continual artificial hibernation. 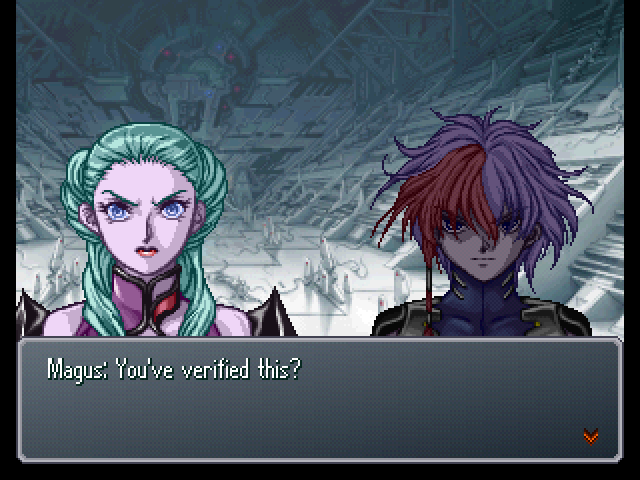 : Then why did she use the name Magus instead of her real name? : (.........) As Khamen said, some incident caused the core and the Machine Cells to go out of control... It could be that she's become something other than human. : About that name, Egret... The same name came up when looking into people related to the Earth Cradle's construction. : Fehu...? It's a different name from the one that boy gave. : That is not the only difference. 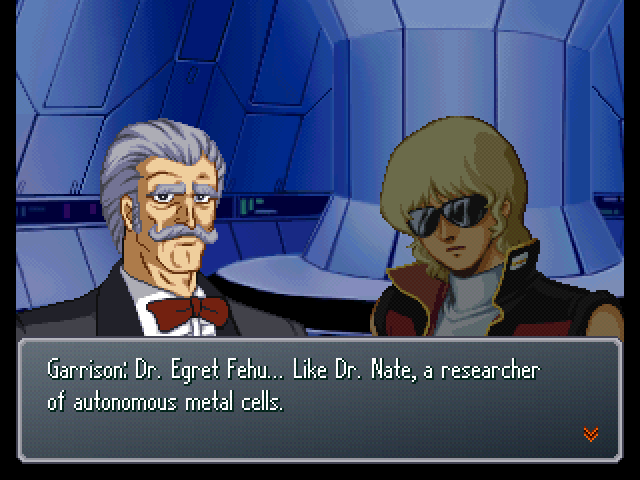 In remaining records, Dr. Fehu's age was 37... His appearance was also completely different from that boy's. : I guess it's not the guy's kid either, huh. : I think it is most likely either an artificial lifeform Dr. Fehu created... or a human with biological modifications. : ...It's not that simple... They're as bad as the Meganoids... No, worse! : And who is the remaining person involved with the Earth Cradle? 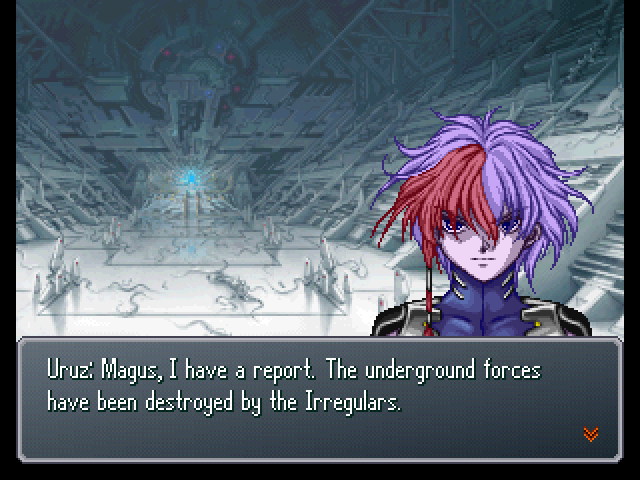 : Recorded as the one charged with the Earth Cradle's defense. : Quite. We've also roughly established the basis of their mobile weapons. Sir Kamille, if you would be so kind as to explain. 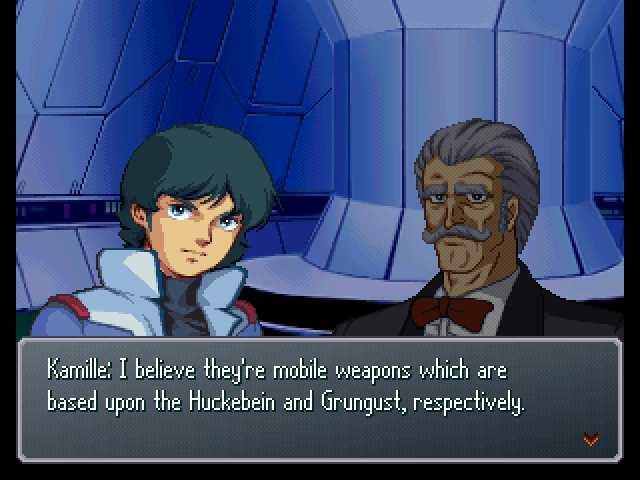 : The Huckebein and the Grungust...!? 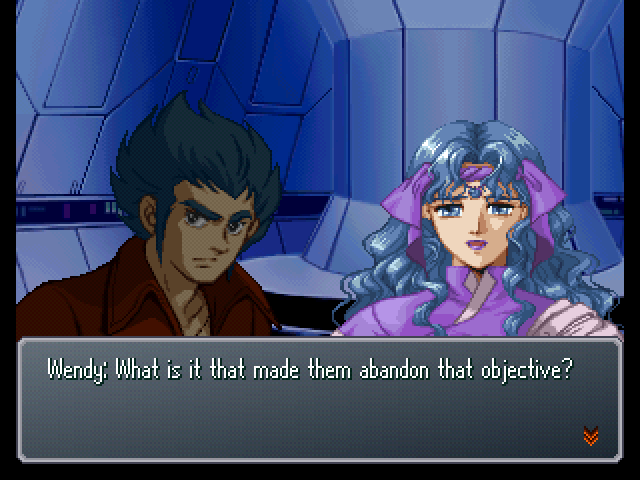 : Kamille, what's your basis for this? : When we went to the Earth Cradle's counterpart, the Moon Cradle... There were mass-produced Huckebein Mk-IIs and Grungust Type-2s there alongside the G-Bits. : Ah, yes, there were. : According to Lt. Viletta, those two models were deployed as defense back in the Space Era. : Is this true, Lieutenant? : So... 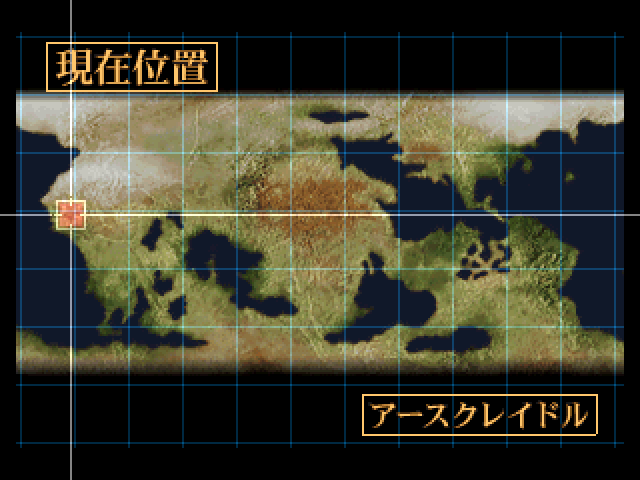 I think there were Mk-IIs and Type-2s deployed at the Earth Cradle, too. : We judged that the two pairs have strong structural similarities. : We believe the structural components and power source are different, but... The height, the frame, the type of application... There are many points with similarities. : I compared the data on both groups' weapons, too. The Bergelmir has remote weapons just like the Huckebein... And the Thrudgelmir has an on-board weapon very similar to the Grungust's Boost Knuckle. 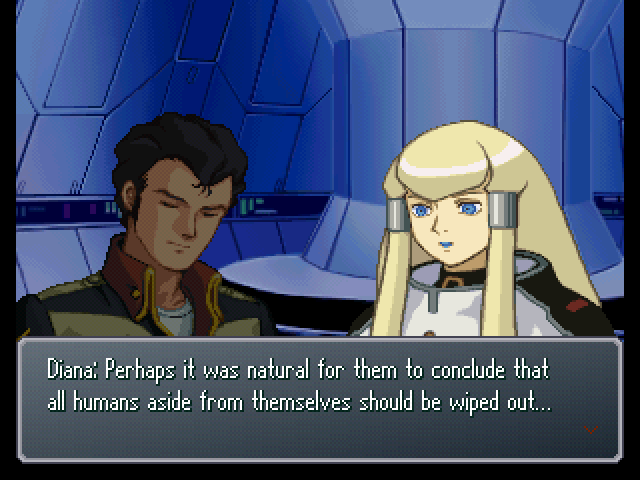 Given this, I think Kamille and Cenia are onto something. : The Grungust Type-3 was under development during the Balmar War, as a successor to the Type-2... It was a machine equipped with drill weapons and a gigantic sword. 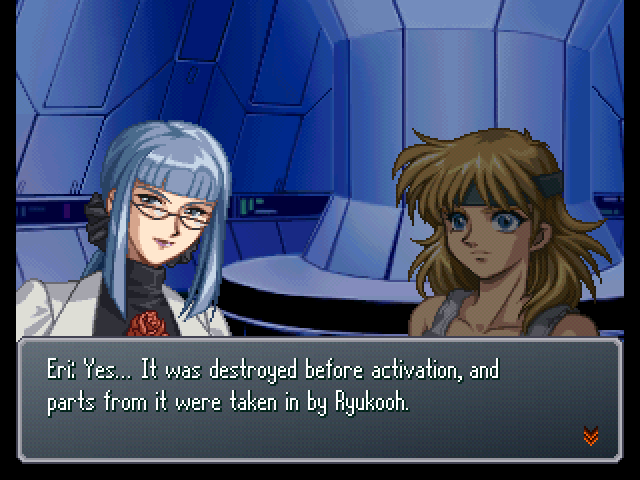 : So, then... What's a destroyed machine doing in this time period...? : The Type-3, like the Type-1, had 3 units developed at the same time... One of those units passed into DC hands, and was given over to the Earth Cradle. : And I conjecture that Sanger Sombold was that machine's test pilot, as well. : Mk-IIs and Type-2s physically altered by Machine Cells. That's what I think. : That just about covers everything. : Yes. 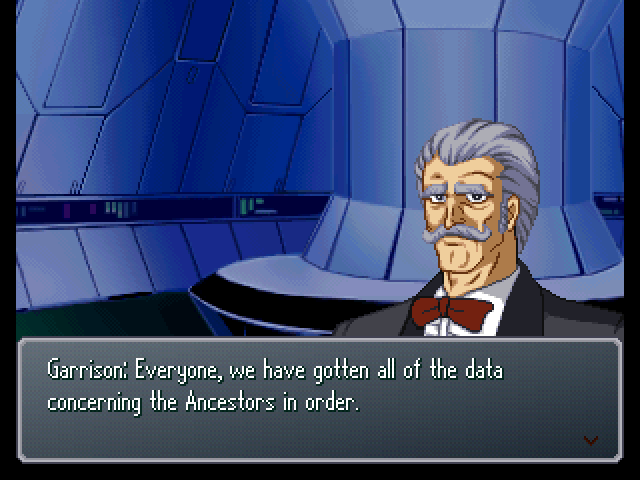 The Ancestors are humans, like us... And survivors from the Space Era, on top of that. 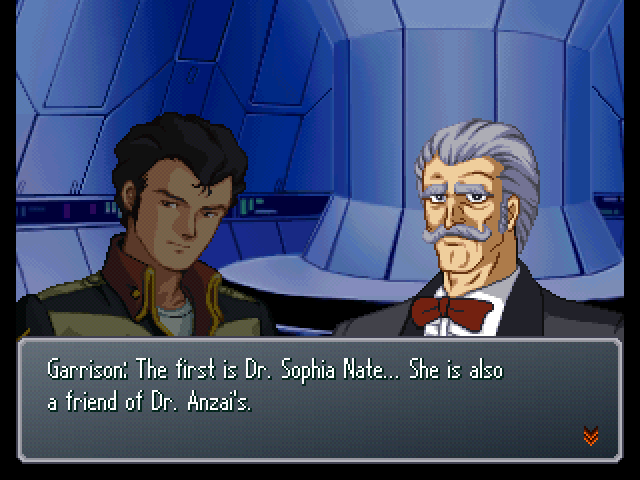 : Dr. Sophia Nate, whose mission was to ensure humanity's survival in the future... Has been transfigured into an Ancestor who seeks to destroy humans to ensure the Earth's continuance. : (.........) ...Therein lies the final question regarding the Ancestors. According to Lady Diana, they and D.O.M.E. both carried the goal of ensuring humanity's survival. : (.........) ...To ensure humanity's survival, there are some requirements. : But, the Ancestors are no longer human. They're just a system gone haywire, one with killing mankind as its objective. : Lady Diana, from here on out, this will be a battle of survival. We can't sit back and yield to them. : (.........) Whether we're right or not... There probably won't ever be an answer to that. But we won't voluntarily choose our own deaths here. 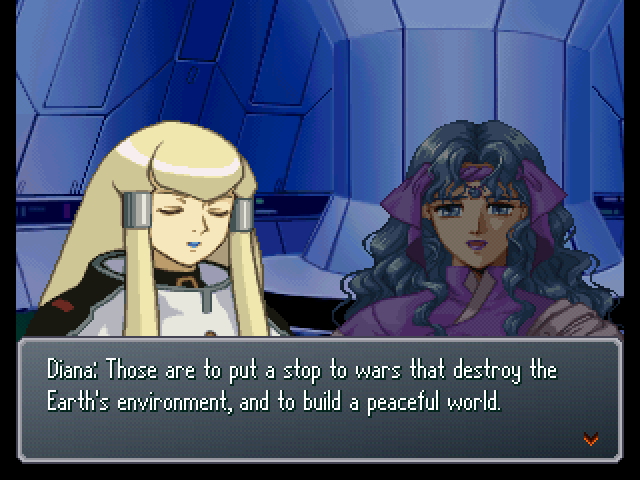 : If we lose to them here, mankind is sure to become extinct... That would make the fighting we've been through all this time meaningless. : ...You all speak the truth. To avoid losing the peace we've finally attained through so many hard battles... We must fight once more, with those who seek to destroy Man. ...That must be the mission we have been given. 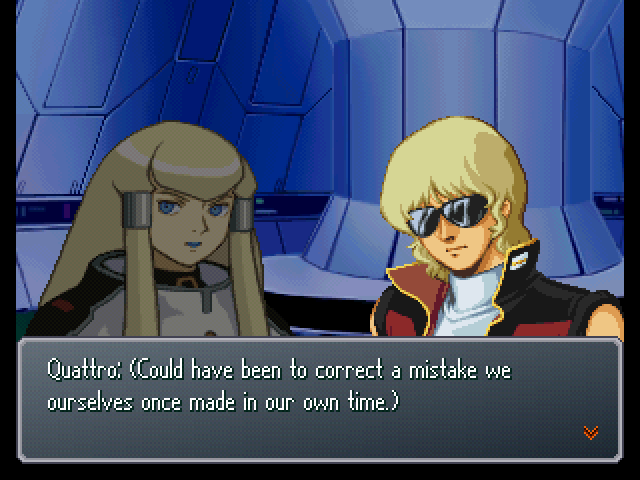 : Lt. Quattro, Lt. Burning... Begin going over plans to attack the Earth Cradle immediately.